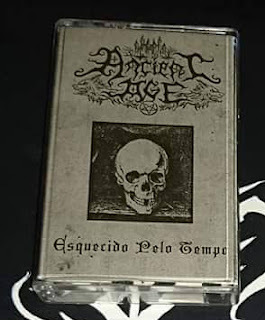 Ancient Age are a solo project from Brazil that plays a medieval form of black metal and this is a review of his 2017 demo "Esquecido pelo tempo" which was released on cassette by Unholy War Productions. Epic sounding synths start off the demo before going into more of a heavier and melodic direction while the vocals are mostly grim black metal screams along with the first track being very long and epic in length and when the music speeds up a decent amount of blast beats can also be heard. Throughout the recording you can also hear a great mixture of slow, mid paced and fast parts while the tremolo picking gives the songs more of a raw feeling along with the music also having a lot of 90's influences as well as the guitar leads also being done in a very melodic style, growls can also be heard briefly and there are also a couple of dungeon synth style instruments before closing the demo with a heavier track. Ancient Age plays a musical style that is mostly rooted in raw and epic black metal while also mixing in dungeon synth style instrumentals, the production sounds very dark and raw while the lyrics are written in Portuguese and cover darkness, death, anti Christianity, blasphemy, nature, medieval and occultism themes. In my opinion Ancient Age are a very great sounding medieval black metal solo project and if you are a fan of this musical genre, you should check out this demo. RECOMMENDED TRACKS INCLUDE "A macabra danca da morte" and "Esquecido pelo tempo". 8 out of 10.